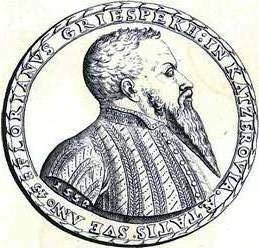 Florián Gryspek (1509-1588) came from one of the oldest Bavarian aristocratic families. Their residence Griesbach lies in Lower Bavaria where the Gryspek family has been living since the Middle Ages. The oldest most famous ancestor is according to the family genealogy Adalbero de Griesbach, supported with evidence between 1096 and 1120. His family continued not only its aristocratic boom but also its fortune widening for centuries. They had a lot of children and they had to look for jobs in military, church and court services. Florián was born on 18th December, 1509 in Innsbruck. His father was Georg Griessenbeck from Griesbach (+1525) and his mother Kateřina from Grünhof. They had together four other sons. Florián´s father Georg, who represented the 10th generation of the family, left the family castle Gryspach in Lower Bavaria to set off for a service and career. In 1493 he became a clerk of the emperor´s office and a court inspector in Innsbruck, where Florián was born. When Georg died in 1525, he belonged to the oldest clerks in the court services of the Habsburg emperors Maximilián I and Karel V. He started a family tradition of the Gryspek family as a clerk aristocracy in Habsburg services and his son Florián could follow his good reputation. He was prepared was his career fairly well because his family paid attention to his studies and spent a lot of money on them. He studied Roman law at the Italian university in Bolon and philosophy and theology at the Sorbonne in Paris. His education, family tradition and his father´s closeness to the emperor´s Habsburg family led Florián to court services, actually to Ferdinand I who started his reign in Bohemia in 1526. This first Habsburg ruler on the Czech throne preferred Catholic foreigners to local Protestant aristocracy. Karel V, the emperor, recommended the young Gryspek for the services under Ferdinand I personally because he had known him from the Innsbruck court. A 21-year-old young man started his career at the Prague castle in 1530 as a royal secretary. After that he was quickly promoted as far as to the position of a valet of the president (=minister of finance). Throughout his court service he was working for three after each other following Czech kings and German emperors - Ferdinand I, Maxmilian II and Rudolf II. Florián Gryspek was a capable diplomat, a humanistically educated companion and a reliable clerk who was serving to the Czech rulers for 58 years. His main positives were mainly his devotion to the ruler and his religion. That´s why he was also involved in several conflicts with the Czech aristocracy which misused the absence of the ruler who went fighting against the Schmalkaldic association in 1547. They captured Gryspek and put him into prison in the White Tower at the Prague castle. When the king came back, he released and rehabilitated Florián and showed him his sympathy by giving Florián manors and credit. 1547 was also very important for the town of Kralovice because it was promoted to town by Ferdinand I. However, we must return to 1539 when Florián´s relationships with Kralovice started. When a half of Kralovice was pawned by the abbot of Plasy to Florián Gryspek, it wasn´t clear what this meeting would bring. The Plasy demesne, whose part was Kralovice since the Middle Ages, was often pawned, creditors often changed and because they were also in dept, they paid by other pawns. However, this was the first time Kralovice was pawned to a foreigner who came from Tyrol far away from here and he settled down in the Czech lands together with the Habsburg family. In 1543 Florián Gryspek gained also the second half of Kralovice and the pawn was confirmed for the time of four generations. This action gave Kralovice and the Kaceřov demesne almost a hundred-year-perspective and also increased the interests of the Gryspek family in its development. Florián Gryspek represented a type of a bureaucratic and intellectual aristocrat in the time before the battle on the White Hill. He and other supporters of Ferdinand I participated in bureaucratizing of the Czech crown chamber before the half of the 16th century. He managed the agenda of not only the register manager, secretary but also the chamber administrator. He soon became a useful clerk in Habsburg services. He used the same pragmatism not only while managing the royal finance but also his own possessions. He acted very precisely, registered the income and duties of his subjects (the urbarium of Kaceřov) and issued regulations dealing with administration of authority agricultural enterprises (The Direction of Nelahozeves, 1588) and statutes for the Nelahozeves demesne (Griespek farm code, 1588). Clear sense for installing the laws and duties meant progress and rationalization of social economical relationships. Although Florián lived more than ten years in Bohemia, he found his wife in Innsbruck. In 1542 he married Rosina Hölzel from Silian. In the same year she gave birth to their first from 24 children Václav (1542-1590), who was the continuator of the family. Rosina Hölzer came from a family of the emperor´s administrator and Tyrol chamber president Blasius Hölzer from Silian (1460-1526), who had ten children. He left behind a big property. He gave Rosina 1600 florins which were insured as a dowry at the Kaceřov manor in "land boards" which Florián gained. Rosina´s sister Alžběta married Wolfgang Volland von Vollandseck who was a secretary of queen Anna, the wife of Ferdinand I. The next sister Kateřina gained a demesne of Kočov in the Tachov region with a court and ten villages. She had one single and childless daughter whose demesne Florián Gryspek inherited. He left it (one of his seven demesnes gained in Bohemia) to his sons. That´s how he established the Czech branch of the family and he gained here a land property and a coats of arms. He signed a commitment to the Czech land in the 30s of the 16th century and renewed it on 10th May, 1557. Under the rule of Ferdinand I (1526-1564) there were very close relationships with Tyrol. That´s why Florián Gryspek continued the contacts with Innsbruck. Florián´s brothers also take part in Habsburg services. Ernst Gryspek together with Florián were charged by Maxmilián II as commissioners to examine the mines in Kutná Hora. Hannsen (Jan) Gryspek was registered as a valet in the suite of the archduke Ferdinand from Tyrol to Prague in 1565. On 2nd October, 1561 he was accepted as a Czech dweller. Florián took pride in his coats of arms which had an interesting development. Its appearance can be seen on his personal medal which he got made on different life occasions. His first one was from 1536 with the Latin personal creed "Invia virtuti nulla est via (Without virtue there is no way or for the virtue there isn´t an insurmountable way) and "Improbus labor omnia vincit" (Persistent work overcomes everything). Before Florián got his properties in Bohemia, he gained a house in Hradčany in Prague in 1538. He got it from the Metropolitan chapter right next to the Prague castle. After the conflagration of the Prague castle in 1541 he got it rebuilt and remained its owner until 1561. In that year it became the foundation of the future archiepiscopal palace. Gryspek´s house in Hradčany showed also his social status. Florián´s house ranked among palaces of the oldest Czech aristocracy. At the very beginning he didn´t have any access to them because he was a Catholic and foreigner. When Ferdinand I was crowned an emperor in 1558, he showed his support of the Catholic church by the restoration of the Prague archbishopric. Its archbishop became Brus from Mohelnice, after 140 years the first after-Hussite archbishop. In order to have a seat of the archbishopric at the Prague castle, the emperor bought Grypek´s palace. Florián Gryspek bought another house in the "Lesser Town" in the Karmelitská Street where a memorial tablet reminds him. A property boom of Florián Gryspek was followed by building castles and residences (Kaceřov, Nelahozeves) and also by building St. Peter and Paul´s Church in Kralovice where a family tomb was added. As he was in services on the court, Florián Gryspek met Italian Renaissance artists and made them work in his demesnes. He used not only their services but also a big emperor´s support. He personally wasn´t mean and belonged to the main knight patrons of humanistic literature. He supported not only a lot of humanists but he also belonged to a small group of "sponsors" who provided finances for publishing Czech books. Although he was a Catholic, he kept brisk written relationships with well-known European reformers. Gryspek´s first meeting with the leading reformers was at the empire congress in Augsburg which was organized by Karel V to unify the questions of religion. Gryspek took part in it in the suite of Ferdinand I. He met there Filip Melanchton for the first time. He represented Luther with the "Confessio Augustana" proposal. The emperor Karel V agreed with this proposal, which led to the separation of religion. The meeting with Melanchton, who was modest and sensible, meant a very important contact with the tolerant type of humanism for Gryspek. He kept in touch through correspondence with him. Melanchton's pupils were supposed to be Florián´s common guests at Kaceřov and Nelahozeves castles. Literary and philosophical persons met there and Gryspek pleaded for them at the emperor, although they belonged to the other group. As an example, we can mention Matouš Collinus - a humanist, Melanchton´s pupil and a lecturer at the Prague university who was supported by Gryspek. He also supported two pastors from Jáchymov (Lutherans) - a theologist Jan Matthesius (Luther´s biographer) and a teacher in the Latin school Niklas Hermann who published his own collection of religious Lutheran songs which have been sung so far. No wonder that they glorified Gryspek in their poems and literary works. The emperor tolerated such support of protestants, although he wouldn´t have supported it by the others. When "the Augsburg peace" started to be valid, which meat that people had to have the same creed as their master, Gryspek didn´t force his subjects to have his creed and gave them religious freedom. He only forced them visit the church service every Sunday and on holy days. His sons had been first educated by Humanistic preceptors of non-catholic creed and later, under the influence of Filip Melanchton, he let them study at non-catholic universities in Altdorf, Basel, Strasbourg and Paris. Like their father, they belonged to important patrons of literature in the 16th and 17th century. Marriages with Czech noblewomen from non-catholic families, tendency to Evangelic belief and political ideas of some of Florián´s sons in the Czech uprising of the Esates between 1618 and 1620, for which their possessions were confiscated, give evidence about the fact that the second generation of the Griespek family merged with the Czech estate environment and grew away from the interests of the central royal politics. After Ferdinand´s death, his son Maxmilián II. (1564-1576) became the emperor and Florián also became his confidant and privy councillor. Maxmilián was more tolerant towards Protestants than his father. So Florián turned to the ultraquist consistory to send their priests. Since that time, they received Communion of consecrated bread and wine in the Gryspek churches. The abbot of Plasy didn´t like these ideas, especially when Gryspek invited also Lutheran pastors to his demesnes in 1570. He remained a Catholic till his death. Florián died on 29th March 1588 in Nelahozeves. Fourteen days later, he was buried in the tomb in St. Peter and Paul´s Church in Kralovice. His sons had him made a beautiful epitaph and they were later buried in the tomb, too. The Czech branch, despite a lot of Florián´s children, stayed only a little bit longer than the four generations. The last Czech Gryspek died in 1678 in Střeziměř in the Klatovy region. Under the rule of Florián Gryspek, Kralovice experienced a big upturn, emancipation and legal rise. When Kralovice became a part of the Plasy dominion, it was just a common dependent town. The Gryspek family could be remembered by the Renaissance church and chateaux that disappeared in the 20th century without any trace. The dominant of the town, St. Peter and Paul´s Church, still reminds the old memorable times of the emperor´s clerk. The visitors of the church can get to know about the life of the Czech branch of the Gryspek family in the Chapel of the holy God.